To address concerns for Dartmoor’s precious environment, some limitations have been agreed with the National Park Authority. Rob Steemson, who has been coordinating action, emphasises that while Ten Tors may contribute to wear and tear, it is only one of Dartmoor’s uses that can cause environmental damage. Route Selection. To spread wear on the countryside whilst training, Team Managers are strongly encouraged to use areas other than Dartmoor, including both lowland and other local moorland areas, to select sites other than the tops of tors as checkpoints, and to make use of public rights of way. Care must be taken not to damage areas that are protected as Scheduled Monuments, Sites of Special Scientific Interest or Rare Bird Nesting Areas. Prior to planning any training, the Green Card must be read and adhered to. Archerton. Stay on the bridleway around Archerton at SX 640791: do not allow walkers to stray onto private driveways. Tor Royal. The track from Tor Royal SX 600732 to Bullpark SX603734 is NOT a public right of way and is not to be used. Water Hill. 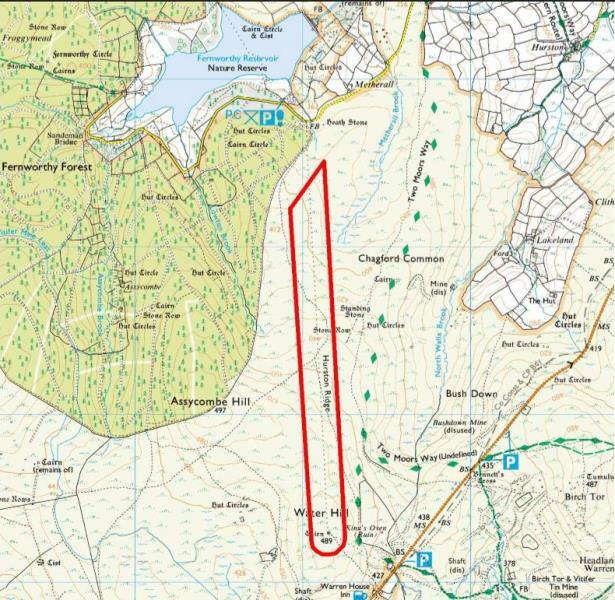 To give the worn tracks time to recover, the area depicted below is not to be used for Ten Tors training. However, having rested the area, Water Hill will be available for use as a checkpoint for the Challenge. Annex A to the Rules is currently being rewritten and will be published shortly. The manned locations have been updated and can be found here or under Ten Tors Challenge - Routes. One of an ongoing programme of conservation work days planned with Dartmoor National Park Rangers during 2019. The job here is to clear out cross ditches and install some new ones to combat erosion caused by a combination of recreational use and heavy rainfall at this iconic Dartmoor location. Please feel free to join in for as long as you can over either day. Conservation work days are a great way of getting healthy exercise in a fantastic environment and meeting like-minded people, as well as helping to look after this special place. You will also learn more about Dartmoor’ s important industrial and prehistoric archaeology, wildlife habitats and rare species, moorland management and the work of the Ranger Service and all FREE of charge. Come prepared with suitable clothing and a packed lunch. All tools and equipment provided together with light refreshments. Booking is essential so that we can organise tools, equipment and refreshments. If you wish to receive regular updates on conservation working opportunities or other Dartmoor news, sign up for our free newsletter. Wed 9 Jan 2019 — Award Application & Where's To? If your establishment requires extra copies of the Where's To? booklets, they are available for printing following the link here. 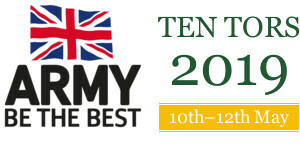 The Ten Tors Award Application has been updated and is available here. The closing date is the 01 April 19. To view information regarding Donate for Dartmoor follow the link here . The payment section on your TM Dashboard is now open and closes 2359hrs on the 31 January 2019. As discussed on the TM Brief, we can only accept PayPal payments this year and once payment has been made it's non-refundable. The discounts that companies are willing to give TT participants has been updated, they are displayed under the Infomation tab on this website. If you would like to order offical photos from www.photo-fit.net from previous Ten Tors events as a Christmas present, the deadline is the 14th Dec 18. Downloads are instantaneous. Access the site from the Facebook link on the TT website page. There are 2 tabs 'About' and 'Discussion'. The 'About' tab provides general info about TT and allows you to share. The 'Discussion' tab allows you to make posts, like, comment etc. On a final note, we are eternally grateful for the many years of meritorious service that David Canon continues to provide Ten Tors, not the least of which has been his sterling work with the previous Ten Tors Facebook site. As you are aware, Gift Your Gear supports Ten Tors and in addition to supplying us with personal clothing and equipment for our teams, it also co-ordinates the allocation of donated tents (both large and small). Simply use the link; here and follow the instructions (you will have to collect yourself).